Miami Animal Removal is available 24 hours a day, 7 days a week to professionally handle situations involving South Florida wildlife. Let us keep your family, pets, and property safe. 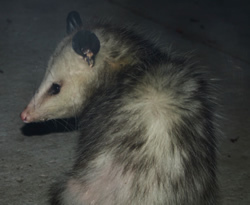 Opossums are opportunistic omnivores with a very broad range of diet. Their unspecialized biology, flexible diet and reproductive strategy make them successful colonizers and survivors in unsettled times. Originally native to the eastern United States, the Virginia Opossum was intentionally introduced into the west during the Great Depression, probably as a source of food. Its range has been expanding steadily northwards, thanks in part to more plentiful, man-made sources of fresh water, increased shelter due to urban encroachment, and milder winters. Threatened opossums (especially male) will growl deeply, raising the pitch as the threat becomes more urgent. Males make a clicking "smack" noise out of the side of their mouths as they wander in search of a mate, and females will sometimes repeat the sound in return. When separated or distressed, baby opossums will make a sneezing noise to signal their mother. Miami Animal Removal can capture these and other nuisance animals in the Miami-Dade / South Florida area. See our services page for more details or just give us a call right now at (786) 594-1189. Miami Animal Removal is Fully Licensed and Insured.